Wow!! That's scary! We lived on an army post and the lawn guy was mowing the yard and hit a croquet ball (not ours) and it shot right through our front glass window, down a hall and hit the couch. Shattered the front door. We were still finding glass several months later! 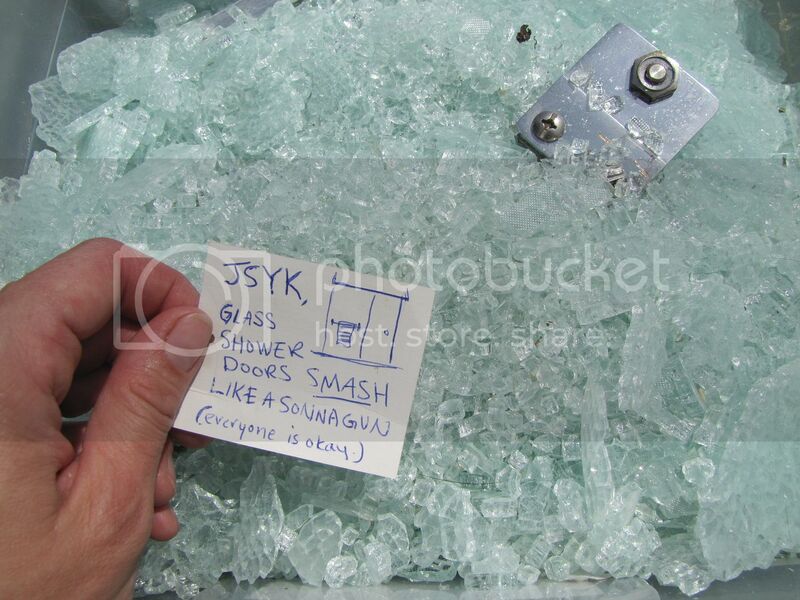 Thank goodness for safety glass! Glad no one injured! No way! MY 3yr old just pushed ours in and off the track. We now have a broken roller wheel, but the door is thankfully intact. Good Luck! hmm, we had an incident(as it has come to be known) with a BB gun and sliding patio doors. They shatter pretty darn well too. I did want french doors... my darling daughter says, wow if we would have known Daddy would replace them with ones so pretty-- we coulda shot those out seven years ago. Dayum! I need to show this to the few people I know who laugh when I tell my 15 monther not to bang on glass ("oh it's thick it won't break"). So good no one got hurt! Glad everyone is ok, I've never been a fan of glass in showers anyway...too hard to clean!